HIWAY AMERICA -BEALE STREET MEMPHIS TN. This week, tens of thousands of blues musicians and fans will descend upon Beale Street in Memphis, Tennessee for the Blues Foundation’s International Blues Challenge — a competition where representatives from blues associations across the world compete for the top spot in a four day battle of the bands. The winner receives great accolades, as well as guaranteed headliner positions on numerous blues festivals across the country. The IBC’s host, Beale Street, is one of the most famous musical streets in the world, and boasts a long and storied history. 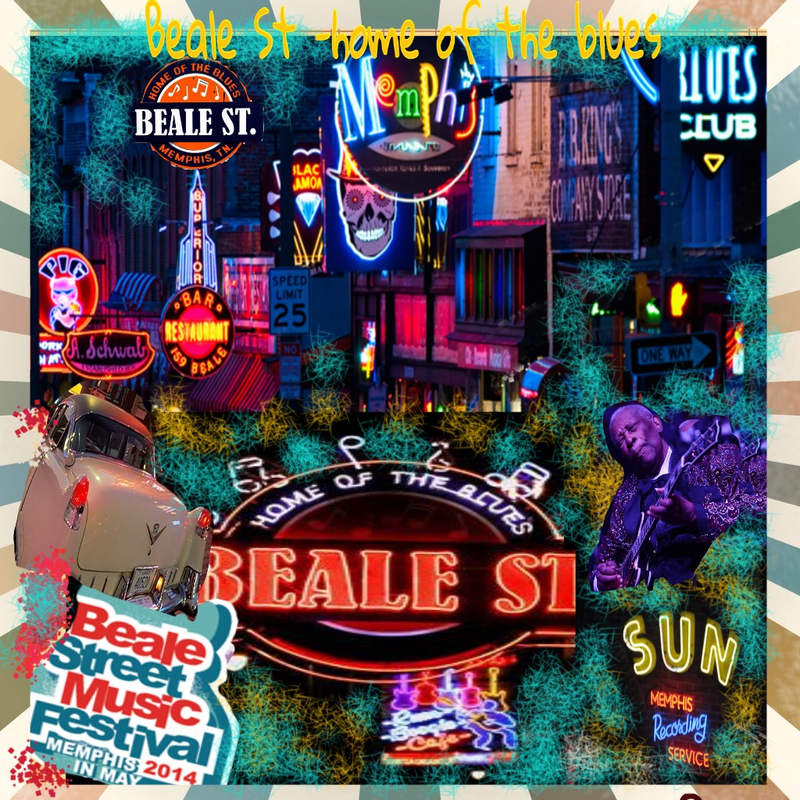 For over 150 years, Beale has hosted Blues music, entertainment, drinking, gambling, and even murder. Beale played a pivotal role in branding Memphis as one of the most musically rich cities in the world, and was prominent in hosting some of the first Black business owners in the south. In between, the sometimes-infamous street was host to the birth of Blues music, the civil rights movement, Rock n’ Roll, and countless beers, racks of ribs, and bands. Beale Street was first created as a part of South Memphis by city planner Robertson Topp. Though the origins of how Beale was given it’s name are murky, the official story is that it was named for a long-forgotten war hero. 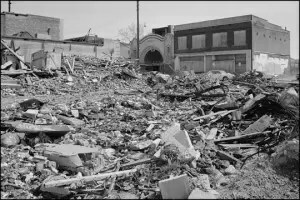 During the early days of Beale, the area became home to a great number of freed slaves and free African-Americans, many from the Mississippi Delta, as well as Irish and Italian immigrants, living peacefully among Memphis’ residents, with reportedly few racial tensions. Much of the lack of violence that was so destructive in the Jim Crow south was attributed to the occupation of Memphis by Union troops. During Union occupation, many black men were recruited and commissioned as soldiers. Once the war was over, however, the troops left and racial tensions quickly came to a boil, resulting in the Memphis Riots in 1866, where a number of black churches and homes were burned, and over forty African Americans lost their lives. The horrors committed against the black community during the riots led to the rapid ratification of the 14th Amendment, stating that every person should have equal protection under the law. This would be the backbone of civil rights cases that, 100 long years later, would break longstanding Jim Crow policies, stir peaceful protests in the same neighborhood — and on Beale Street, and tragically end the life of one of the greatest American heroes, and the most powerful civil rights champion, just blocks away. 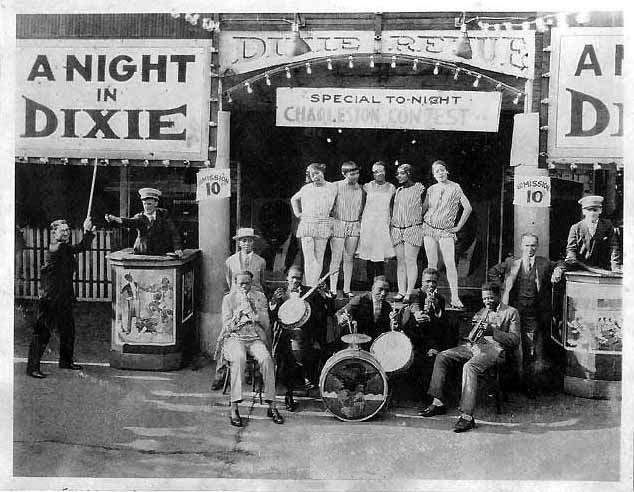 Beale continued for decades to act as a relatively safe haven for racial minorities in the city — a place where people could enjoy themselves free from fear of malice, where African Americans could own businesses, largely without the concern of oppression or terrorism from the government or racist sects. Politicians in the area were well aware of the power in numbers within the community, especially in the strong voting power of the black minority, and as a result, continued to ensure a largely peaceful co-existence of the neighborhood around Beale. By the turn of the 20th century, Beale Street had become something of a self-contained microcosm, with churches, a pharmacy, grocery, public housing, and entertainment. Beale had also become a place with a dark underbelly — where murder in it’s rough-and-tumble gambling halls was a regular occurrence. Many men spoke about the infamous Monarch, on 340 Beale. In Paul Oliver’s Conversation with the Blues, a number of former Beale residents spoke with candor about the building that was known as “The Castle of Missing Men”, where many gamblers and drinkers went in but never came out. Behind the Monarch was a funeral home, and it was reported that men who were killed in the bar room for cheating, arguing, or some other perceived injustice, would be quickly and quietly carried to the crematorium through the alley. The famous gangster Machine Gun Kelly sold bootleg liquor on Beale during the prohibition, as the area took on what has been described as a “carnival” atmosphere, where ambulances waited in rows for the next victim to stumble out of a gambling hall, bluesmen played on corners and in door frames, traveling shows pushed alcohol labeled as “medicines”, and iconic figures like Bessie Smith played the Old Daisy, (which still stands and will be hosting a number of blues acts during IBC). W.C. Handy was probably Beale’s most famous resident prior to Elvis Presley, and his presence continues to be felt through his giant statue, a museum on Beale dedicated to his life in his original house, and numerous other accolades showered upon the man known as the “Father of the Blues”. A mayoral candidate in the early 1900s, in an effort to win the black vote, hired Handy to create a theme song for his mayoral bid. The resulting tune was “Mr. Crump”, which Handy reworked and released as “memphis blues“, which quickly became one of his most famous numbers. W.C. went on to be a highly successful artist and band leader with numerous hits to his credit, earning his position as arguably the most celebrated of the decades-long list of musicians on Beale. Parks, bars, and streets bear the name of Handy, who’s music is celebrated as an irreplaceable part of Americana music. In 1946, a young man named Riley B. King trekked to Beale to seek out his Cousin, musician Bukka White. While King had cut his teeth playing on Church Street in his adopted hometown of Indianola, Beale was a much larger platform, and King “got his licks” busking the famous street. He landed a job as a disc jockey for WDIA radio station in Memphis by making an on-the-spot jingle. It was there that he picked up the handle of the Beale Street Blues Boy, which was later shortened to Blues Boy, and finally, B.B. 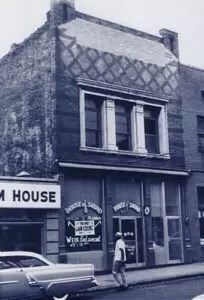 45 years later, the celebrated blues club bearing his name was opened with great fanfare on the corner of Second and Beale. Just a single block away, Gibson Guitar’s famous factory produces B.B. King’s signature ES-355 Semi-Hollow body, and boasts a two-story likeness of King’s famous “Lucille” in the reception area. At the same time as B.B. was earning what would become international widespread fame, another young man was daily found roaming the streets of Beale in search of the blues. A shy and wiry Elvis Presley couldn’t stay away from the blues music that moved him. “When I was in Memphis with my band, he used to stand in the wings and watch us perform,” B.B King said to Sepia of the future fellow “King”. 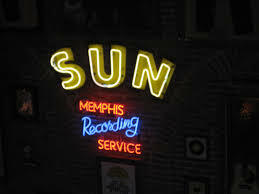 Not long after, the young man wandered into Sun studio to make a single record “for his mother’s birthday.” Owner Sam Phillips called him back some months later, and on the weekend of July 4th, Presley cut “That’s All Right Mama”, a blues number by Arthur Crudup. Elvis was an instant hit, becoming a driving force in the creation of what Jerry Wexler would soon call Rock n’ Roll. But through his international accolades and unprecedented worldwide fame, Presley always called Memphis home. Purchasing a tract of land and large house south of town, he called the estate Graceland. by the mid-1960s, The Civil Rights movement was in full swing. Brown v. Board of Education, using the 14th Amendment (created in the wake of the 1866 Memphis Riots), had finally cracked the “Separate but Equal” laws which were masquerading as equality, but ultimately, were used to continue to enable widespread segregation. 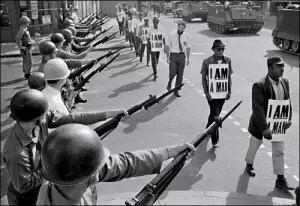 Peaceful protest marches and demonstrations began across the south as African Americans struggled for equality. Memphis became a hotbed of activity in the movement, home to many key civil rights events such as the 1968 sanitation strike. On April 3rd, Reverend Doctor Martin Luther King, Jr. returned to Memphis, as he had a great number of times, to make a stirring, compelling, and ultimately prophetic speech, known by many as “I’ve Been to the Mountaintop”. On April 4th, 1968, only 6 blocks from Beale, an assassin gunned Dr. King down as he stood on the balcony of the Lorraine Motel, now known as the National Civil Rights Museum. Fueled by the interest in blues, rock & roll, B.B. King, and Elvis Presley, a strong investment was made into the street in the 1980s, fueling re-establishment of new businesses, and revitalization of old ones. Tourists made their way back to the Home of the Blues, slowly at first, then quickly, as the live music poured into the streets. By 2009, Beale Street alone was reporting nearly $32 Million in gross sales. With the revitalization and tourism that has come with the street in the past two decades, there has been some criticism that the street has become a sort of caricature of it’s former self. Regardless, the music has a nearly unprecedented opportunity to bring new exposure to the millions that walk the streets of Beale during their trips and vacations — undoubtedly the first time many new visitors are even willing to hear the blues. As thousands of bands, fans, major blues players, entertainers, and reporters (including American Blues Scene) descend on Beale, the street once again takes a party atmosphere as only the blues can provide, colliding a searing helping of original Memphis soul with dozens of different styles, takes, and interpretations of hundreds of artist’s blues music and dedication. Most of the buildings that exist on Beale are the same buildings that have been frequented by the great many music lovers and great musicians that came in the 100 years before, providing a proprietary sense of history to the legendary street. In 1890, Beale Street underwent a classy renovation with the addition of the Grand Opera House, later known as the Orpheum. The Orpheum, originally built in the late 1800s and rebuilt in grand fashion in 1928 after a fire, was a place for vaudeville, nationally touring shows, and early movies. Sparing no expense, the theater was built to be larger than life — a Memphis jewel. During the International Blues Challenge, the best-of-the-best will adorn the stage at the Orpheum, and a 2012 winner will be crowned! American Blues Scene will be covering the event, as we do every year, and will be bringing you up-to-the-minute happenings. Stay tuned to the American Blues Scene to be at the event without leaving your screen.